This RCAD was motivated by an ATC terryeo1 shared on her channel. There was a beautiful face and it inspired me to draw this face. I do enjoy trying to draw faces. The background was another one I created with my Gelli Plate and Lumiere paint. This card really shines. 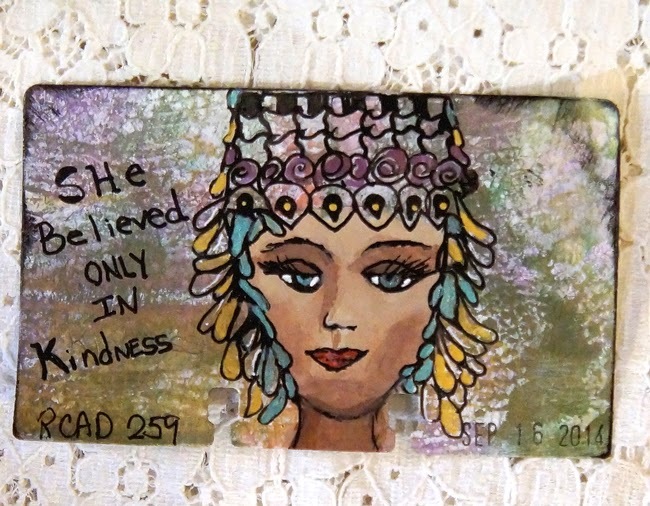 I wrote on the card She believes only in Kindness. I hope your day is filled with kindness. Oh my word this face is fabulous! I love faces but am not that good at drawing them. Thanks for sharing this beauty. So clever to draw the face yourself Linda - it's really great!